"This is your life - what do you want to do?" Ambi Media Group and Spotted Cow Entertainment debuted an official trailer for an indie coming-of-age film called In Search of Fellini, which is indeed about a young woman's search for Fellini. Ksenia Solo stars as a shy small-town Ohio girl who discovers Federico Fellini's "delightfully bizarre films" (see IMDb) and sets off on a journey across Italy to find him. Along the way, she discovers herself and romance and tasty Italian candy and much more. The cast includes Maria Bello, Mary Lynn Rajskub, Beth Riesgraf, Andrea Osvárt, and David O'Donnell. This looks quite adorable, and cute, very much a film-lovers adventure, though it does seem a bit cliche with its story. Enjoy. In this coming-of-age adventure, Lucy (Ksenia Solo), a shy small-town Ohio girl who loves movies but dislikes reality, discovers the delightfully bizarre films of Federico Fellini, and sets off on a strange, beautiful journey across Italy to find him. In Search of Fellini is directed by South African filmmaker Taron Lexton, making his feature directorial debut after the documentary The Way to Happiness and a few short films previously. The screenplay is written by Nancy Cartwright and Peter Kjenaas. This played at the San Diego & Newport Beach Film Festivals. 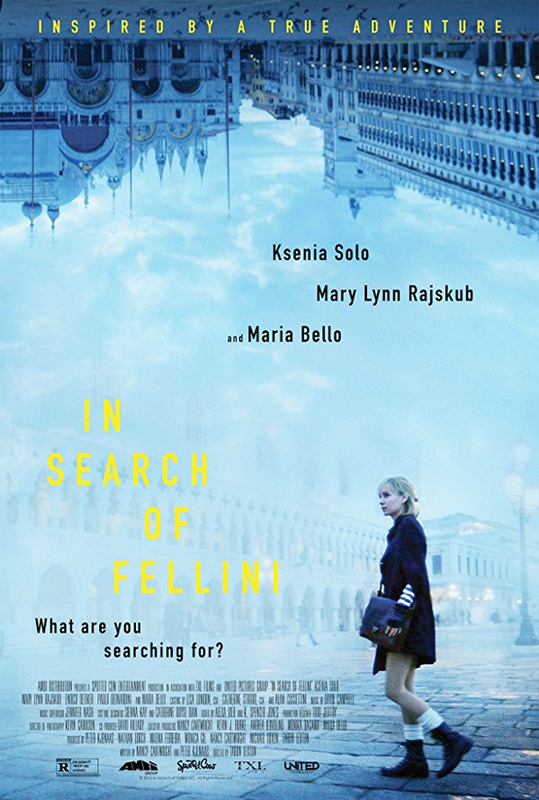 Ambi Media Group will release Lexton's In Search of Fellini in select theaters starting on September 15th this fall. For more, visit the film's Facebook page. Thoughts?